It’s a poverty of our modern lexicon that “luxury” and “expensive” are practically synonyms. As the renowned interior designer Charlotte Moss alludes, luxury has everything to do with feeling—and nothing to do with price tag. Case in point: The CS 5460 toothbrush from Swiss maker Curaprox. Each costs a mere $6.95, but in our minds it’s as beautiful as some of the Swiss timepieces ringing in at several thousand times that amount. The humble hygienic device is a testament to the out-of-the-box engineering the neutral nation is famous for. Its octagonal handle ensures the most advantageous brushing angle, and it manages to pack in 5,460 filaments (those would be the tiny threads that do all the brushing), each of which is just 0.1 millimeters in diameter. But its technical merits are only half the story. The brush is beautiful. It’s considered. It’s fun. It’s designed with the whimsy of a Caran d’Ache fountain pen or a Swatch watch. Offered in 26 different color combinations, juxtaposing handles and bristles colored orange, lime green, magenta, and much more. It’s like brushing with an Ellsworth Kelly. The art of living well begins in the minutiae and the mundane—right down to the requisite ritual of brushing before bed. And an object as beautiful and simple as a Curaprox toothbrush may help us remember to enjoy it while doing so. Your banker. Your child psychologist. Your high school principal. However and wherever you came across these early authority figures, they likely shared one thing in common: a desk nameplate bearing their name or station in life. They knew—as we do now—that you only get one chance to make a first impression. And in that moment, a gold-framed strip of walnut fastidiously inscribed in white letters implied significance. We wanted one… someday. Perhaps we even attained one prematurely, thanks to a nominal appointment as captain of the debate team or a successful (if at all disputed) run for student council president. And just when we thought we’d made it, the high school yearbook arrived announcing one-dimensional superlatives such as “Most Likely to Become President,” “Best Smile,” and “Class Clown,” only to be bestowed upon a chosen few like titles in a feudal kingdom. And if there can only be one of each, where does that leave everyone else? That’s why we’ve repurposed the desk plate, twisting it into something… self-deprecating. These aren’t titles you’ll find on the desk of a tenured professor or senior United States senator. These are about coming to terms with unfulfilled potential. We like to think of them as desk plates for antiheroes. 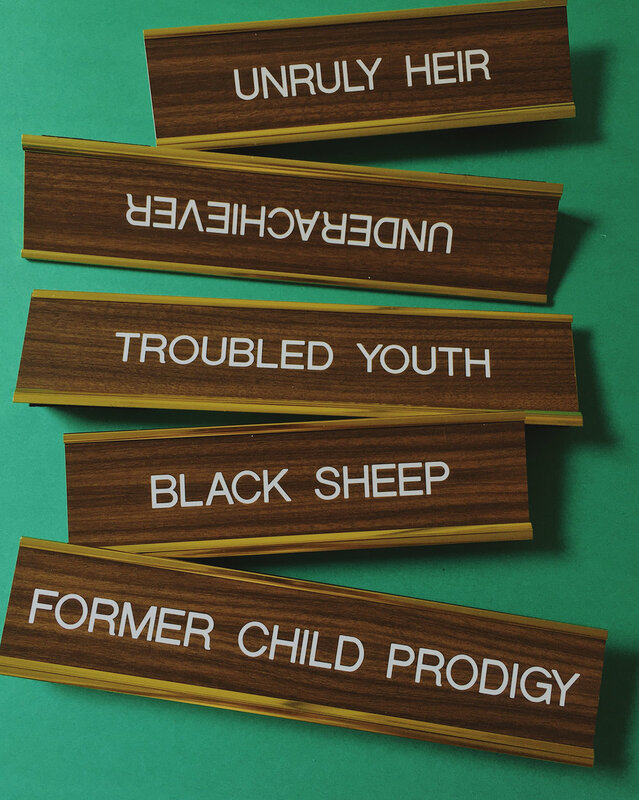 “Former Child Prodigy.” “Underachiever.” “Black Sheep.” “Troubled Youth.” “Unruly Heir.” They're desk plates for the names they call you behind your back. Beat them to the punch before they take their seat. Richie Tenenbaum with longtime family accountant Henry Sherman. Narrator: Richie Tenenbaum had been a champion tennis player since the third grade. He turned pro at seventeen and won the U.S. Nationals three years in a row. He kept a studio in the corner of the ballroom but had failed to develop as a painter. It is totally impossible to be well-dressed in cheap shoes. Hardy Amies* said that. We believe that. Now you know that. No matter what you’re wearing with them, an English bench-made shoe is what separates the men from the boys. As the name implies, bench-made shoes are hand-tooled on a craftsman’s table or cobblers bench as they undergo up to 250 different operations. A single shoe will pass through an assembly of English artisans with names straight out of a Harry Potter film—the last-maker, the pattern-cutter, the clicker, the closer, the maker, the socker, and the tree-maker—before eventually landing in the inky embrace of the polisher. Have we worn bench-made penny loafers with sweatpants? Absolutely. You could dress like a juvenile in a pair and discerning types would still know you’re a man with his priorities in order. Expensive Goodyear-Welted shoes can last almost as long as you do if you take care of them. The key is in their ability to be re-crafted. Whether you’re sending off a pair of Alfred Sargents, Church’s, Aldens, Crockett & Joneses, or Allen Edmonds, each cordwainer’s process is similar. Shoes are stretched over their original lasts (to retain shape and appearance), soles are replaced, welting, laces, and heels are replaced, and the uppers are refinished—they essentially look new again, all for about the price of a cheap pair ($125-$200). We sent off a pair of Fred’s well-worn Allen Edmonds’ tassel loafers to be recrafted ($150, Prestige Package) in Port Washington, Wisconsin. They came back four weeks later looking brand new, yet feeling as familiar as the back of his hand…oh, and they’ll last him at least another 5 years. *Not some random Englishman with a fancy one-liner. Amies was a fashion designer and dressmaker for Queen Elizabeth II. He knew a thing or two about being well-dressed. As if that wasn’t enough, he designed the costumes for Stanley Kubrick’s 2001: A Space Odyssey (one of the greatest and most influential films ever made). So not only did he know about being well-dressed on Earth, he knew about being well-dressed in space too, in case Earth wasn’t impressive enough. Ok, enough vouching for Sir Hardy Amies. Ooooohhh—he’s knighted! Around here, we love GQ and their crusade to take care of men. Our mission is quite similar and it’s a responsibility we take quite seriously. That being said, I am honored, grateful, and blessed to be featured in GQ’s March issue as a GQ Insider (essentially, a tastemaker). Crack open the 1999 volume of a Weatherford High yearbook and inside you will find my portrait under "Most likely to be on the cover of GQ." That superlative was bestowed upon me by my classmates. Today, I'm one step closer to fulfilling that facetious prevision. Our peers often see our potential before we see it in ourselves. Listen to them. Notice. From a small Texas town of 18,352 people, a kid who was curious about clothes made it out of his hometown and into the cornerstone publication of men's fashion. While 50 pages away from the cover, I'm right behind the table of contents...so here's to working harder, better, faster, stronger in 2016. Thank you GQ. Fun fact: Justin Bieber, Leo Chan, and I all sit under pastor Carl Lentz's ministry at Hillsong NYC.